Do you believe that great skin is just down to good genes? Lancome Genifique will change your mind. Created for all women, it’s a collection that encourages you to love the skin you’re in, no matter your age – and it’s all down to a patented blend of yeast, bifidobacteria, hyaluronic acid and ceramides to create firmer, bouncier, glowier and altogether more youthful looking skin. It’s everything you need to feel more skin confident! So, which are the products to try from the collection? We’ve rounded up our favourite ‘can’t-miss’ products below for you to try, fall for, and repurchase over and over again. 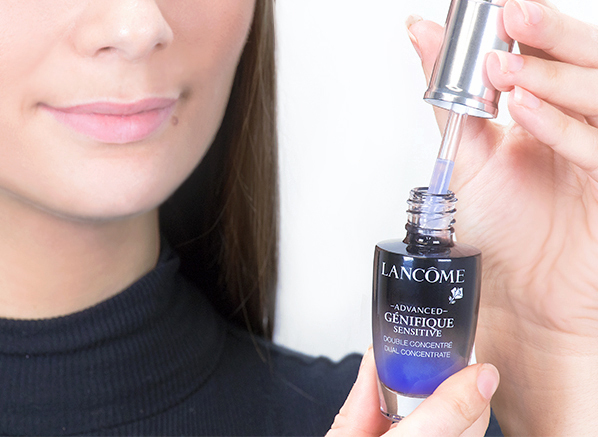 Once you try Genifique and see its effects, you’ll be hooked. 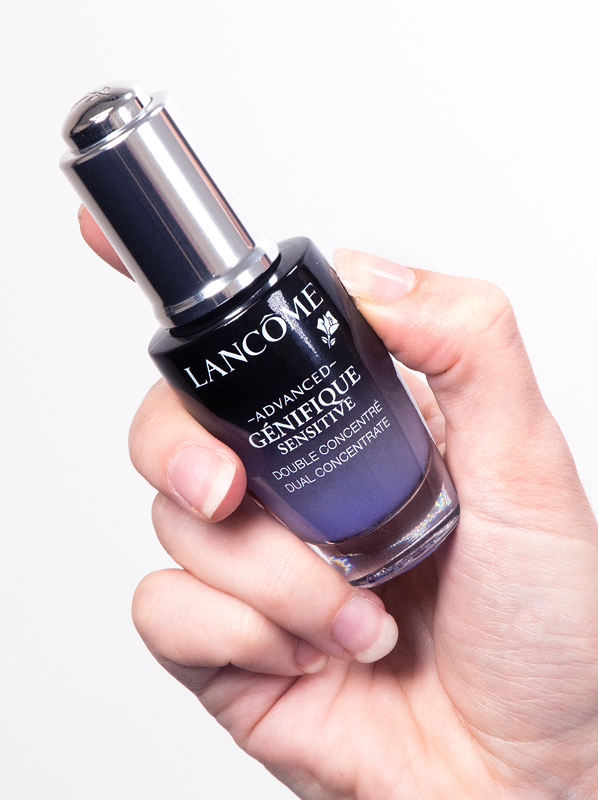 A proud owner of 8,000 5-star reviews, the Lancome Genifique Serum is world-famous. Why? Because it can be used by any and every skin type to reveal radiance and smooth skin in just 7 days. Call it your skin’s security guard! The Genifique concentrate can be used by anyone looking to defy age-related skin concerns, no matter their age or level of skincare knowledge. What makes this serum so different to others is the patented powerhouse of ingredients inside.To create a more youthful look, the serum is packed with tiny, fast absorbing molecules that penetrate deep into the skin. As much as you might normally avoid yeast in your diet, this skin-restoring molecule helps to support your skin’s structure and refine its texture for improved resilience. Bifidobacteria, also known as probiotics including lactic acid, is what strengthens your skin’s barrier for better protection against the environment and defends your skin cells to lower the risk of induced ageing – perfect! Always apply the Youth Activating Concentrate to clean skin before your moisturiser – think of it as your pre-skincare booster shot. Start by pushing down on the pump on the bottle to fill the dropper with the perfect amount of Genifique; it should be enough to cover your entire face and neck. Instead of rubbing, press the serum into your skin and leave for 30 – 60 seconds before applying your Genifique Cream. Dark circles? 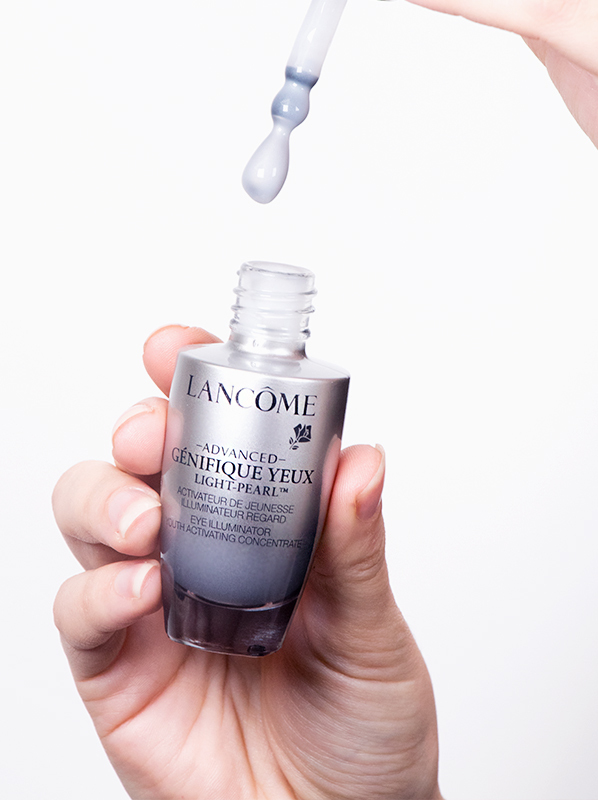 You need Lancome Genifique Yeux Light Pearl Eye Illuminator. A revolutionary eye innovation that’s waiting to brighten, firm and smooth your eye contour, this revitalising tool works to refresh and re-energise, day after day. Similar to the Genifique Youth Activating Concentrate, Genifique Yeux is enriched with yeast to protect skin, offsetting oxidative skin damage, but what’s really special is the 360° Light Pearl™ applicator which cools and calms the eyes (it’s perfect for hayfever sufferers). Eye bags, puffiness, fine lines and all of the common concerns associated with the eye area are diffused with the Genifique eye. Utilise the 360ᵒ Light Pearl applicator to apply this! Gently glide along your eye contour, then pat the serum in with the ring finger. Use after cleansing and before moisturising to ensure the formula absorbs fully and your skin receives the maximum benefit. When skin is feeling temporarily sensitised and is in need of some reinforcement, this is the product to reach for. 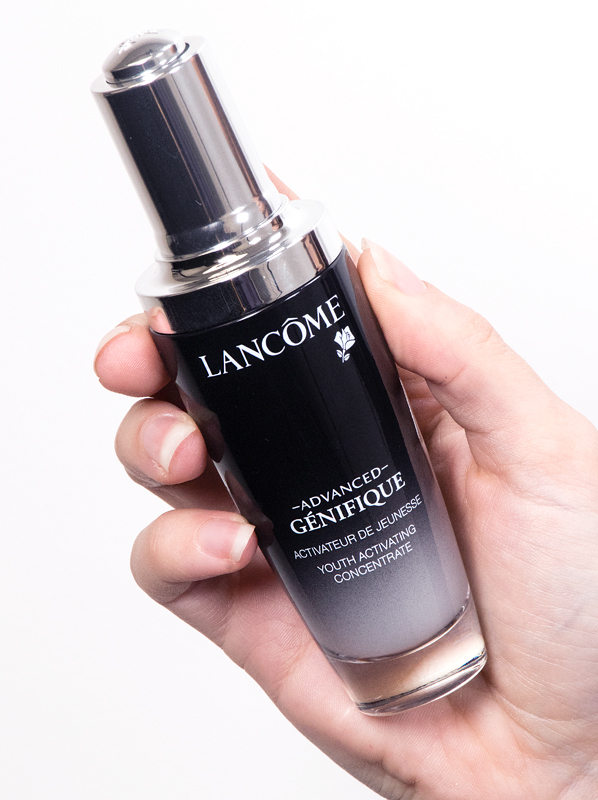 The Lancome Advanced Genifique Sensitive Youth Activating Dual Concentrate saves the day when your stressed-out complexion needs it most; from periods of stress that can make your skin go haywire, to the damage that can occur from exposure to harsh elements, it’s a skin saviour that’ll boost hydration and deeply repair. Whereas the original Genifique Concentrate is your ‘bread and butter’ serum that will support your skin day in, day out, the Genifique Sensitive Concentrate is created specifically for SOS moments. It’s a freshly activated formula, so upon first use you mix the blue core of antioxidant vitamin E and ferulic acid within the pipette together with the nourishing base serum to create a really potent blend. The nature of the active ingredients means that your serum will slowly start to become less potent as time goes on, so it’s best to use it daily for a month solid for best results. Think of it as boot camp for your troubled skin! After it’s finished and your period of sensitisation is eased, you can go back to maintaining your skin with the Genifique Concentrate. When you first open your concentrate, push and twist the cap to release the blue concentrate into the base serum, then shake until they’re combined. Apply a few drops into your hands and press it into cleansed skin before following up with your favourite moisturiser (we love the Advanced Genifique Youth Activating Cream below). Use it every evening and wake up to soothed, better hydrated and more radiant skin – it’s all in a night’s work! When a big event is on the horizon, or you’re looking for the ultimate Sunday night detox to reset your skin for the week ahead, the Lancome Advanced Genifique Hydrogel Melting Mask is your ticket to plumped, smoothed and beautifully hydrated skin. The big thing to know about this transformative mask is that each and every one is infused with the same amount of bifidus probiotic extract as one 30ml bottle of the Advanced Genifique Youth Activating Concentrate, so you’re in for some seriously glowing results. Another really cool thing about the mask is the fact that it’s created with innovative hydrogel technology, so rather than sitting on top of skin, it actually melts into it for a powerfully fresh result. Your glow will look so natural, people will want to know your secret! How to apply Lancome Advanced Genifique Hydrogel Melting Mask? The Genifique sheet mask is way more versatile than you think. You can use it to prep your skin for makeup, boost your skin’s glow throughout the day and enhance your evening skincare routine too. 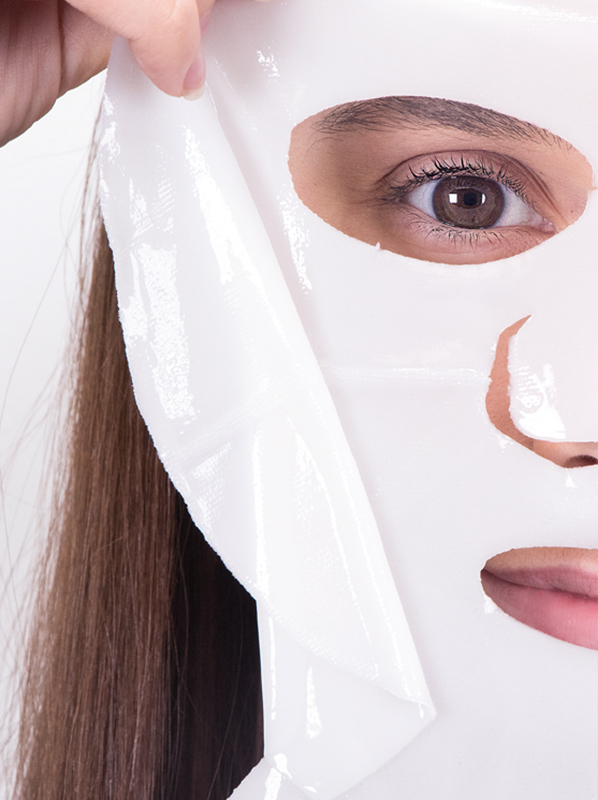 Here’s how to get the most out of your Hydrogel Melting Mask. First, unfold the mask and then remove the transparent film, making sure the gel side is up against your complexion. When the mask sits perfectly, peel away the white outer protection and sit back and relax. To prepare your skin for makeup, apply to skin for 10 minutes, then tissue off any excess and move onto applying your foundation. To give your skin a midday boost, it’s best to use this mask without makeup. Wear the sheet mask for 20 minutes, then massage in any excess. Finally, for an enhanced beauty sleep, pop the Genifique mask on your skin for 30 minutes, taking any of the excess serum down to your neck too. This entry was posted on Monday, November 12th, 2018 at 10:29 am and is filed under New products, Skincare, Tried & Tested. You can follow any responses to this entry through the RSS 2.0 feed. You can skip to the end and leave a response. Pinging is currently not allowed.